Are Seattle’s finest ready to answer the call? Has the Station 19 TV show been cancelled or renewed for a third season on ABC? The television vulture is watching all the latest cancellation and renewal news, so this page is the place to track the status of Station 19, season three. Bookmark it, or subscribe for the latest updates. Remember, the television vulture is watching your shows. Are you? An ABC action drama from creator Stacy McKee, Station 19 is a spin-off of Shondaland’s Grey’s Anatomy, starring Jaina Lee Ortiz, Jason George, Grey Damon, Barrett Doss, Alberto Frezza, Jay Hayden, Okieriete Onaodowan, Danielle Savre, and Miguel Sandoval, with Boris Kodjoe joining in season two. The story centers on the crew of Seattle’s Station 19 — the best of the best. Thanks to close quarters, and the nature of the job, the team at Station 19 has grown into a family. The roots of their relationships run deep, and not all of the action they see takes place on the streets. The second season kicks off in the wake of a deadly blaze, with the life of former Captain Pruitt (Sandoval) hanging in the balance. 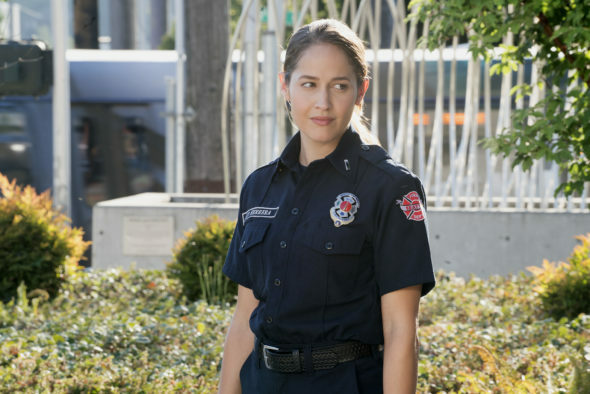 The second season of Station 19 is averaging a 0.95 rating in the 18-49 demographic and 5.26 million viewers. Compared to season one, that’s down by 9% in the demo and even in viewers. Find out how Station 19 stacks up against other ABC TV shows. As of April 25, 2019, Station 19 has not been cancelled or renewed for a third season. Stay tuned for further updates. Will ABC cancel or renew Station 19 for season three? ABC would dearly love a viable Grey’s Anatomy spin-off, but the ratings weren’t great in the first season. The ratings still aren’t very good but I suspect they’ll renew this series anyway. I’ll keep a hungry eye on the ratings and update this page with breaking developments. Subscribe for free alerts on Station 19 cancellation or renewal news. What do you think? Should the Station 19 TV show be cancelled or renewed for season three on ABC? Do you think this spin-off will ever approach the success of Grey’s Anatomy? Please renew!!! I love this show!!! Renew Station 19 for another 3,4,5 -20 or even longer. renew station 19 for a 3,4,5-19 seasons!!! !